Paper clips of standard wire construction are cost effective and deliver high quality paper fastening. 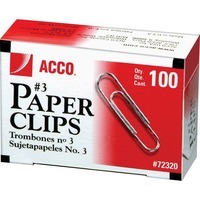 Number 3 size clip holds up to ten sheets securely and zinc galvanized plating resists corrosion. Great for small, lightweight papers. Smooth, silver finish. 100 clips per box. Made in the USA.